Before there was Billy Fuccillo, Kaufman’s “jolly little baker” was Buffalo’s ubiquitous pitchman on radio and TV. 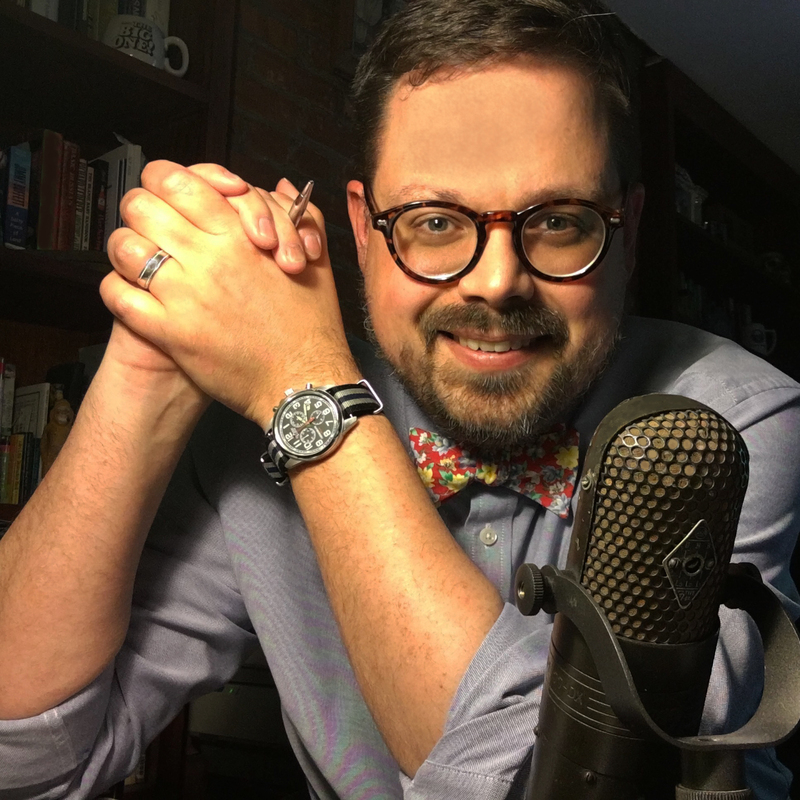 As much as the unique, dense rye bread that still sparks life in the palates of Western New Yorkers, our yearning for Kaufman’s rye bread is tied to the fact that the taste is forever linked to that 18-second jingle, permanently implanted in the subconscious of generations of Buffalonians, which many of us could still sing on demand. Sam Freedman bought the small neighborhood Kaufman’s Bakery in 1937. After several expansions, in 1968 Kaufman’s moved from a cramped East Ferry Street location to the mammoth building — the former Hall’s Bakery — on Fillmore near Main. Kaufman’s bakers Gottleib Zeintl and Sam Freedman in 1990. 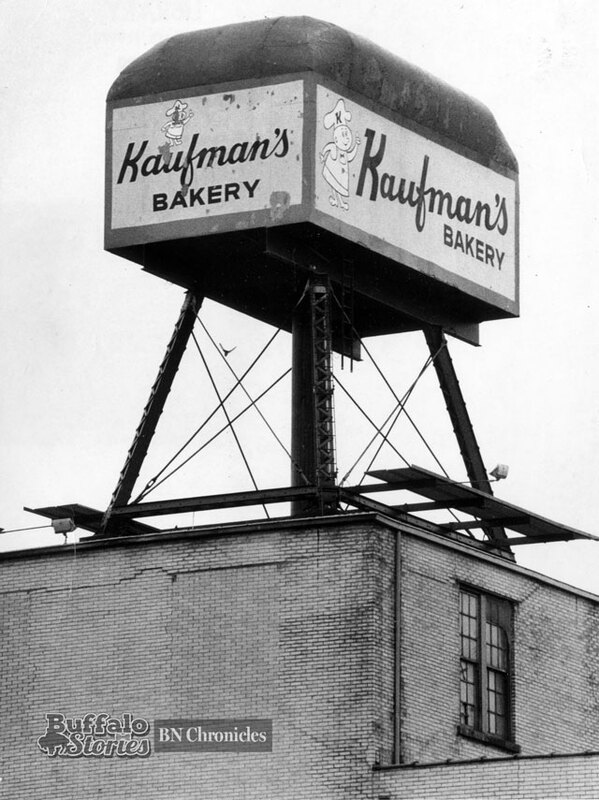 The giant loaf of Kaufman’s was on the roof until 2004, when Stroehman Bakeries — which bought out the Freedman family in 2000 — closed the Buffalo plant. Buffalo not only lost an iconic brand, but the neighborhoods surrounding the bakery — including Parkside and Central Park — no longer woke up to the smell of fresh bread being baked for the first time since at least 1915, when Hall’s bread wagons were hitched on the front corner of what was then the Buffalo Cement Company property of Lewis Bennett. 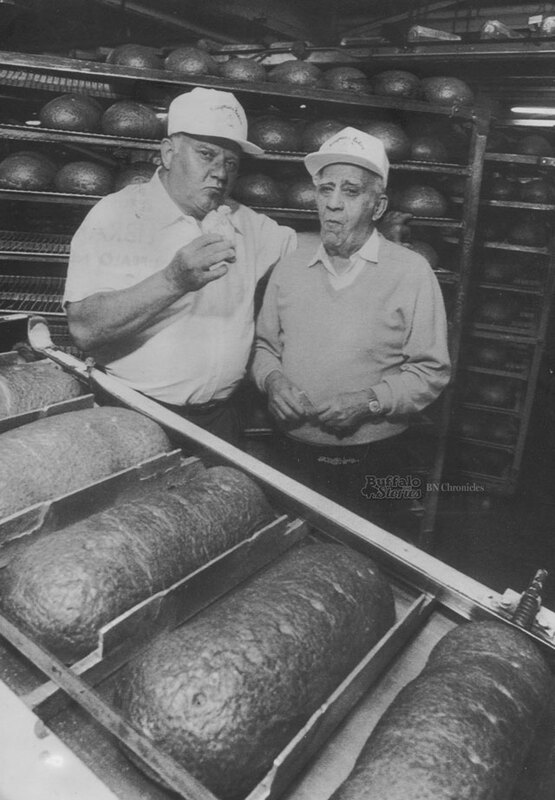 Aside from the well-remembered rye bread, Kaufman’s rolls were a part of the purely Buffalo experience at Ted’s Hot Dogs and many other restaurants.